Heat oven to 350°F. Line large cookie sheet with cooking parchment paper. Unroll 1 can dough on paper-lined cookie sheet. With floured rolling pin or fingers, roll or press dough into 12x8-inch rectangle, firmly pressing perforations to seal. 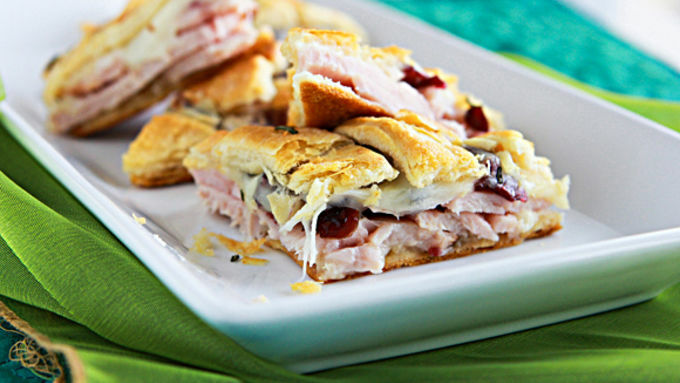 Top with turkey, cranberries and cheese to within 1/4 inch of edges. On 14-inch length of parchment paper, unroll remaining can of dough; press to 11x8-inch rectangle, firmly pressing perforations to seal. Using pizza cutter or sharp knife, cut ten 8-inch strips, separating so 1/4 inch is between each strip. 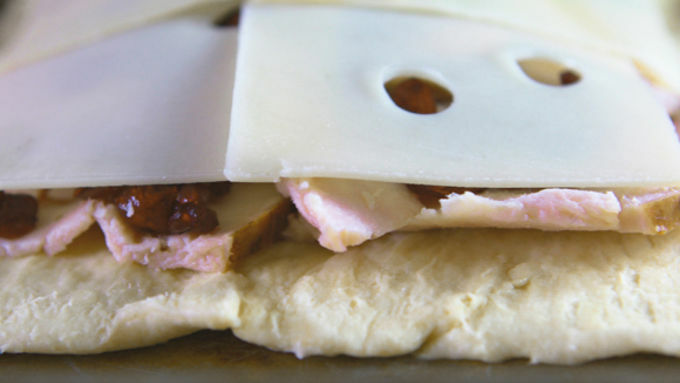 While holding paper with dough strips, turn dough strips upside down over cheese. 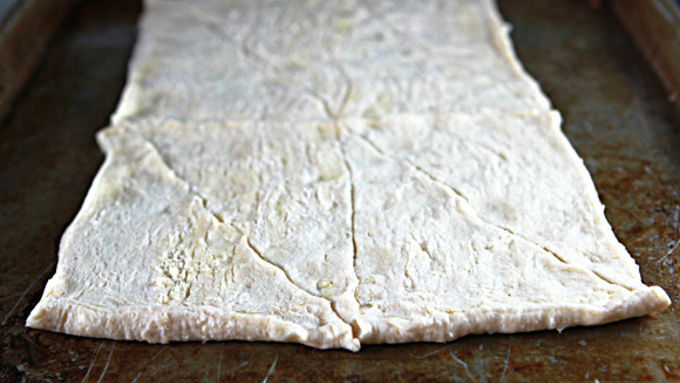 Tuck ends of strips under dough. In small microwavable bowl, microwave butter and garlic uncovered on High about 10 seconds or until melted. 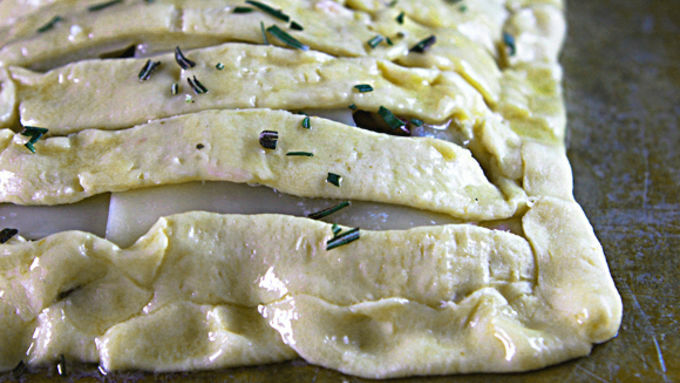 Brush garlic butter over edges and strips of dough; sprinkle with rosemary. Bake 25 to 30 minutes or until edges are browned and center is set, covering with foil during last 10 minutes of bake time if necessary to prevent excessive browning. Remove to cooling rack 5 to 10 minutes. Move to cutting board. Using pizza cutter or long-blade knife, cut into 24 squares, 6 rows by 4 rows, then cut each square in half diagonally. Okay you. It's time to get your mega-partay on and we're going to show you how to shake it out in minutes. And not the sort of minutes wherein you look like you were in a dag-blummed rush. These are the sort of minutes where-in you end up at the end of the recipe with a dish all glitzed up and glamified and delicious. 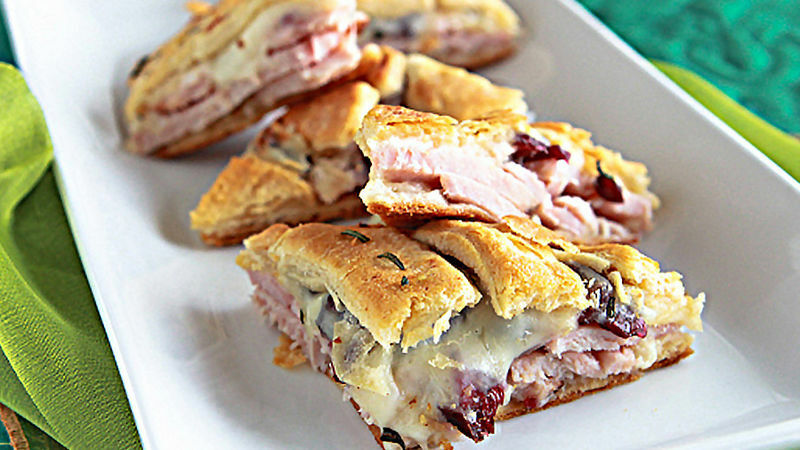 Okay, Turkey-Cranberry Appetizer Pizza, let's go! Once baked, allow your Turkey-Cranberry Pizza to cool slightly, then slice into triangles, squares, or diamonds. We went with triangles. But, darlin', diamonds are a girl's best friend, and now that you've got this pretty appetizer pizza served up, everyone is going to want to be your bestie forever. The end. Just toss your hair back, soak in the love, and know you're worth it.